Symph provides a space for both experienced and new musicians to create and share musical ideas. Users create bite-sized musical loops using a custom visual interface, built with FabricJS on an HTML5 canvas. Music is synthesized directly in the browser using ToneJS, an abstraction over the Web Audio API, allowing users to listen while they compose in real time. Each User has a Loop Bucket, containing all of the Loops they’ve created. They can also browse other user-created loops, and save them into their Loop Bucket for later use. They can then use the Loops in their Loop Bucket to create a multi-track composition, by dragging and dropping loops into our Mix Editor. The Mix Editor was made using custom Angular Directives that utilize the HTML5 native Drag and Drop API. After completing a Mix, you can save it, and it will be visible on the website for friends and other users to find. 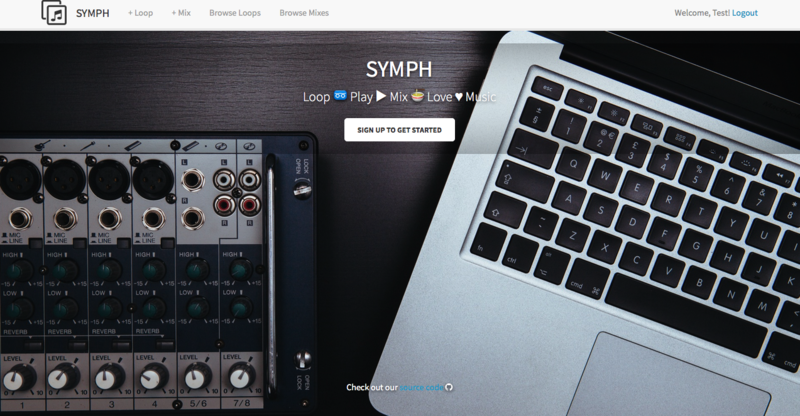 You can also browse mixes created by other users to get inspiration for your next composition.